Get Free Recharge Tricks, Cashback offer, Tech Knowledge etc. : Is Facebook Research App Officially From Facebook and Safe ? Is Facebook Research App Officially From Facebook and Safe ? 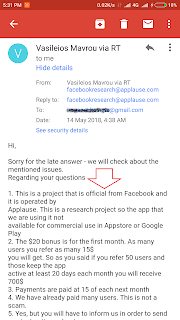 On 4th May we share Facebook Research App with you and that time many user do not believe that this app can pay amount because payout was too high for refer and app giving refer amount every month till friend remain active.Now all user got payment and we also got around Rs.78,000 this month. Now many user are asking some question regarding this app because they are not believing that app can pay high amount every month for just keep it active in background. 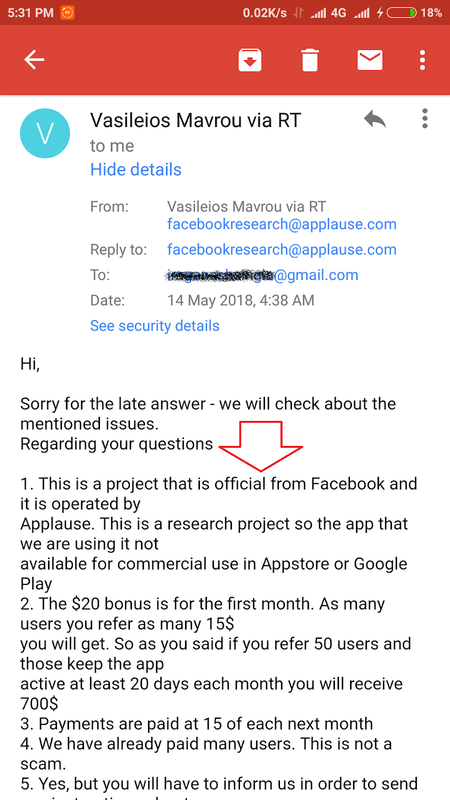 So here is most common question and answer to make sure app is official from facebook and safe. Q1: Is this app official from facebook and safe ? Ans. Yes this app is official from facebook and safe.Here is 3 facts that prove this app is official from facebook. This app was 1st time listed on utest website project list. Utest is a big website for app testing industry across the world. So first we ask them by doing mail its official from facebook or not because utest is a big company and can not reply false things so either it will not reply or else it will reply truth. In reply they clearly say its officially from facebook. Here is screenshot of reply. We ask many question in mail just read 1st point in screenshot. Now we also try to check its official from facebook or not.On utest we see this project was given to Utest by a company whose name is Onavo then we search about this company on google. We found that in October 2013 Onavo was bought by facebook. So Onavo is also part of facebook and app is official from facebook. You can also search on google about Onavo. We also open the app download link and it redirect to a app download platform and we check the signer whose upload facebook research app and we see signer is Facebook Corporation. Q2:Is this pay amount in Real ? ANs. Yes its pay amount in real without any hidden terms and condition. We already got amount $1195 on 16th June. You can check proof of that payment in our post. Q3: Why this app pay so much amount ? Ans. Its a research app for short time period and research apps collects data about which apps, websites, mobile functions you use most and make there website according to your usage or can make new website and earn more than paying to you. If they did not get benefit from this app then they will close this project. Example: Like if facebook research app installed in your mobile and any new field apps growing very quickly then facebook can invest money in that field. Like in previous 2-3 year fantasy website like Dream11 become popular very quickly. So facebook research app can easily identity which field can grow in future and make there own website in that field or invest in companies that already offering that service and earn in crore like dream11 now earning more than 1 Crore in every cricket match. Q4:Why this app is not on playstore and Appstore ? Ans. This is research app and need few users to participate like 20,000 or 30,000 users so if they upload on playstore then more than 1,00,000 people download it within 1-2 day but they want 20,000 to 30,000. In that case user who did not got approval that user start giving 1 star rating. So instead of upload in any store they give this project to utest to handle it participate and distribute amount because utest have already enough experience of these type of project. Moreover this program is invited only and they want person guide to new user ownself instead of new users asking question to facebook so they make this Invite only. The one more reason is facebook may be not want to highlight this research program and want to work silently. Q5: This App will work for Lifetime ? Ans. No this app will work for 9-10 Month only. Rest depend upon how much benefit facebook get by this research app. If facebook getting benefit then this app can work for upto 20 month also but very less chances. So guys must checkout our post and get maximum benefit from this offer.